Research has shown women with disabilities and deaf women face multiple barriers to accessing health care, including cancer screening and treatment. In some cases, health care practitioners focus on the disability itself as a health problem, and ignore the overall health of the patient. Cropped, close up view of two multi-ethnic teenage girls participating in a breast cancer awareness rally. An African American 14 year old teenager is pinning a pink ribbon on her friend's shirt. "Pink madness" began showing up on football fields across North America on Sunday night and it will soon be in full swing. October is Breast Cancer Awareness Month and everything from blenders to football jerseys are imprinted with the ubiquitous pink ribbon, accompanied by promises from corporate sponsors that a portion of your purchase will be donated to breast cancer research or awareness. Beyond the media attention, Canadian public policy, legislation, and even human rights treaties guarantee access to health care. Canada is a signatory to the Convention on the Rights of Persons with Disabilities and has enacted the Canada Health Act both of which enshrine health care as a basic right. The new federal government has committed to using the social determinants of health as a framework for developing new health policy. 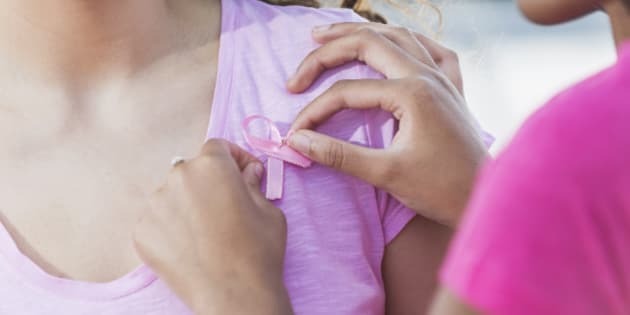 The Public Health Agency of Canada sets prevention and screening for breast cancer (and all cancers) as a high priority. But will women with disabilities and deaf women find the policies, services, awareness, funds and champions to ensure we are not left out of the picture when it comes to this critical health issue for all women? Research has shown women with disabilities and deaf women face multiple barriers to accessing health care, including cancer screening and treatment. For example, they are less likely than women without disabilities to receive pelvic and mammogram exams on a regular basis and are thus at a higher risk for delayed diagnosis of breast and cervical cancer. The reasons for this are due to both physical and systemic barriers. Physical barriers tend to be more evident, such as mammogram machines that require standing or specific positioning, or inaccessible exam tables. Systemic barriers are less obvious, but can include communications as well as attitudinal barriers. For example, information is often unavailable in alternate formats such as American Sign Language (ASL) and Langue des signes québécoise (LSQ) video. As well, there are no qualified ASL interpreters for women who are deaf, deafened or hard of hearing and no communication supports for women who are non-verbal. In some cases, health care practitioners focus on the disability itself as a health problem, and ignore the overall health of the patient. As a result, women with disabilities and deaf women are not encouraged to get screened. The DisAbled Women's Network (DAWN) Canada has a range of resources on breast cancer and disability that can be used to increase understanding of the health care needs of women with disabilities and Deaf women, and to improve access to breast cancer prevention and treatment for all women. But the responsibility for accessible health care cannot rest with a single organization. Rather, it must be taken up collectively -- by policy makers, health care practitioners, researchers and media champions. With awareness, we can all take responsibility for ensuring that all women are "in the pink," including women with disabilities and Deaf women.